Every May, nearly a dozen Goshen College students go to jail. They’re not incarcerated. 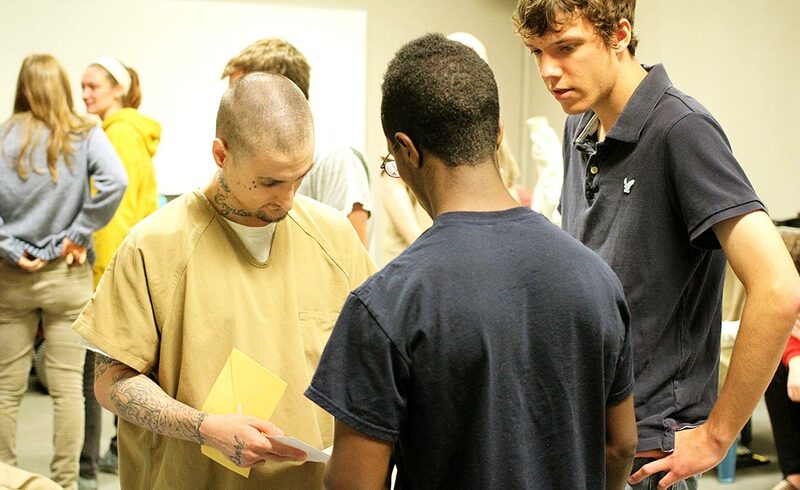 They do, however, get an inside look at part of the criminal justice system – and meet new classmates who will impact their lives. It’s all part of Goshen College’s Inside-Out Prison Exchange program, which takes place over three weeks during the college’s May Term. 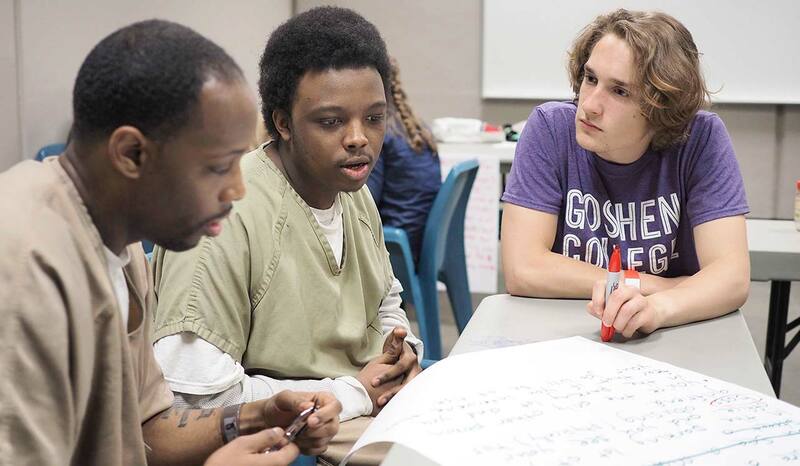 Through Inside-Out, Goshen College students (“outside students”) and jail inmates (“inside students”) learn together and get to know one another at the Elkhart County Correctional Facility. The seed of that future friendship took root at Goshen College. Carolyn Schrock-Shenk, an associate professor of Peace, Justice and Conflict Studies, is one of the program organizers. For several years, she has taught restorative justice, an approach to offender rehabilitation focused on accountability and reconciliation with victims. Schrock-Shenk takes her students into the correctional facility as part of the class. The answer would prove to be Inside-Out Prison Exchange Program, an outreach effort founded in 1997 and based at Temple University in Philadelphia. 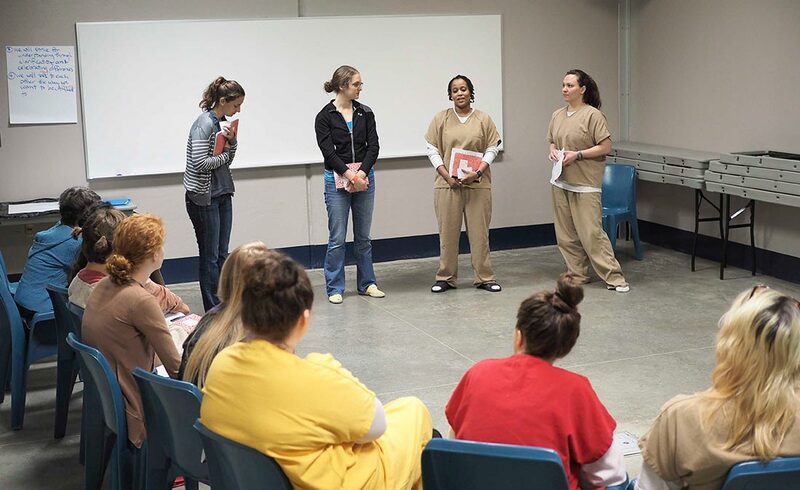 Aimed at breaking down barriers between inmates and college students, Inside-Out has expanded to more than 100 colleges and universities around the globe. Initially focused on criminal justice, Inside-Out courses now include drama, arts and humanities, law, science, etc. Schrock-Shenk heard about the program, and it captured her imagination. 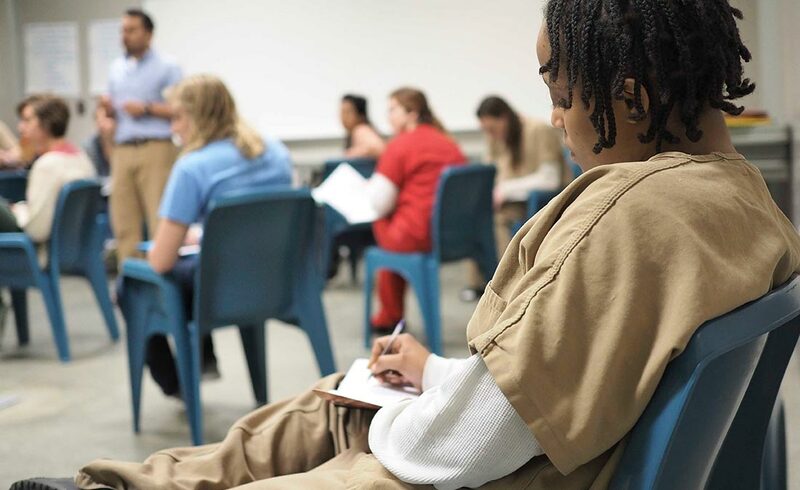 Along with other professors from around the country, she went through seven days of Inside-Out training, some of them at Graterford Prison in upstate Pennsylvania. 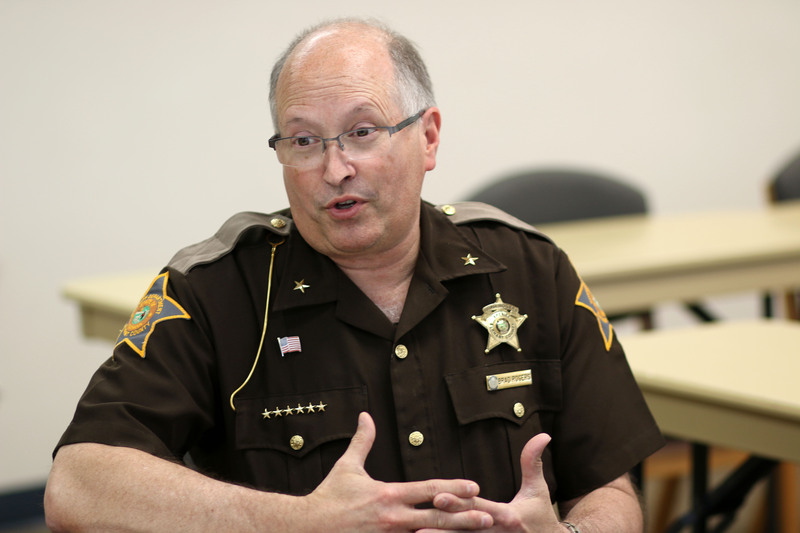 Back home, Schrock-Shenk got in touch with Elkhart County Sheriff Brad Rogers, who felt Inside-Out was definitely worth a try. And most inmates do, in fact, come back to the community. Schrock-Shenk pointed out that 95 percent of people in prison or jail are eventually released, and around 60 percent are re-arrested within 3 years of their release. 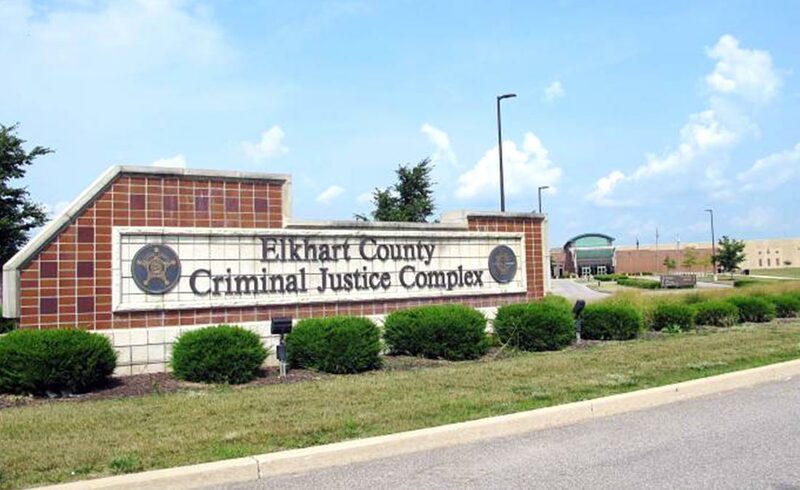 But, citing another statistic, Schrock-Shenk said that if inmates receive education “inside,” recidivism drops by 40 percent. “It’s amazing what education does,” Schrock-Shenk said. Charles has heard personal stories and opinions so different from her own that they prove her Peace, Justice, Conflict Studies minor has value. “I now understand that the reality of the world is nothing like Goshen College, and it needs our help,” she said. Charles has also gained an understanding of both the intentions and shortfalls of the criminal justice system. For outside student Sam Smucker, Inside-Out was an empathetic and humanizing experience. Miller, part of the Inside-Out Class of 2014, isn’t surprised the local program has continued to be offered. Lieutenant Kris Klosinski, education coordinator at the jail, has also seen the positive impact of Inside-Out firsthand. 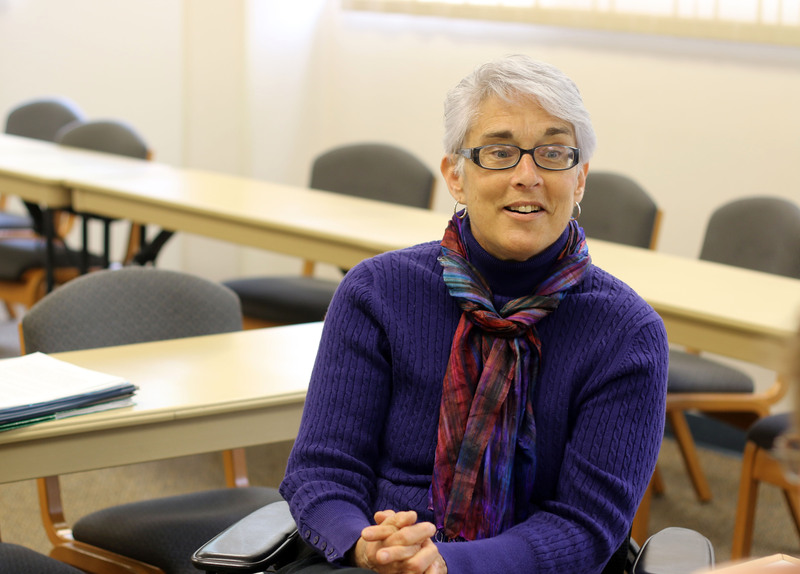 “The outside students gain a better knowledge of the criminal justice system,” said Klosinski. “But more than that, they realize that the inmates are regular people – just like them – who made a mistake,” she said. Klosinski said the inside students have told her they appreciate being able to discuss topics with the outside students, instead of having someone talk to them. “I think the class has given many of them a confidence they didn’t have before, a sense of accomplishment, as many of them have never completed or finished anything of any great significance in their lives before,” she added. Klosinski also notes the contrast between the first and last day of Inside-Out. The end of Inside-Out can be hard on the inside students, too. This year, one of them was due to be released before the class was over. “He was really bummed,” said Schrock-Shenk. However, he was given permission by jail officials to come back as an outside student and finish the class. Schrock-Shenk herself has been moved by the course. She shared a statement from a 2015 inside student.